Definitely, Maybe*: Techie or Foodie? 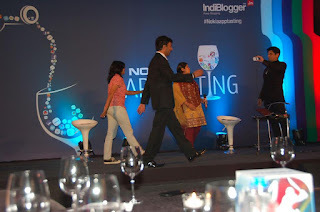 The last time I went for an indiblogger meet , I didn't really get the chance to blog about it due to work and all that. But this time I just couldn't resist sharing my experience of the awesome Sunday , spent with so many nice people mainly because there is a prize, it was SO much fun . 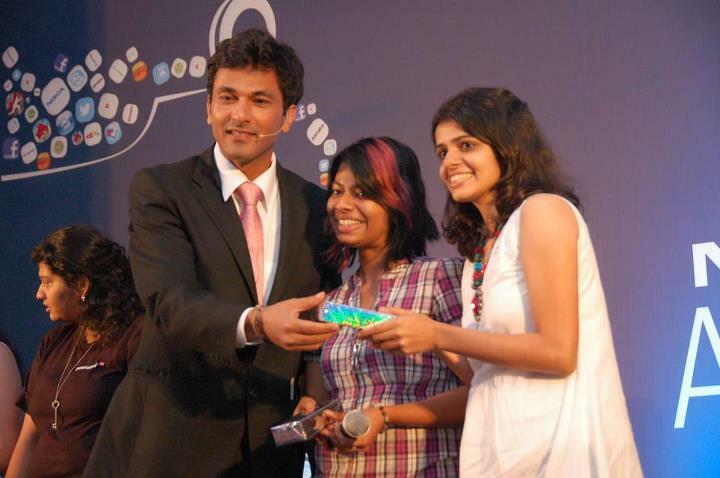 The ever charming , Vikas Khanna and Rajiv Makhani were the hosts for the evening and it was one hell of a night. The question of the evening was Techi or Foodie ? With the Masterchef and Gadget Guru in the house there were bound to be fireworks. Indiblogger always has these amazing memorable meets and something new to offer every single time . 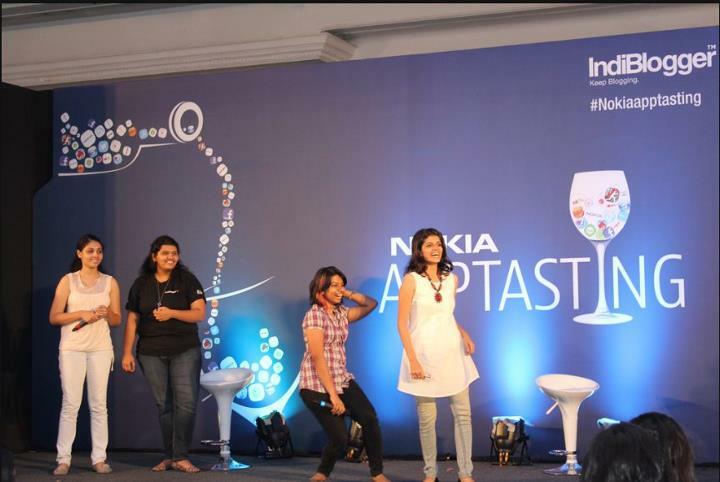 This time with Nokia partnering with Indiblogger , the event was bound to be grand. With about 250 bloggers attending the meet it had to be about " Connecting People " . The food and wine along with the energetic vibe didn't hurt at all. As I walked into the event , a little nervous and a little perplexed about getting bored. I see the grand venue and Nokia's blue carpet , welcoming us . The ambiance was brilliant. ( location : Taj Lands End-Mumbai) This time the meet was all about having fun with Apps , Nokia Apptasting was held at many cities earlier and this time in Mumbai it was like a celebration . Celebration of us bloggers :D Rajiv and Vikas , showed us many of the newest Apps in the Nokia OviStore. My favourite and cutest App was easily the Charlie Chaplin movie App , It just makes a movie for you within seconds. ( Plus Vikas Khanna did a real cute yet awkward ramp walk :P ) Also the which wine goes with which food App was brilliant. I never try wine cause I don't know what to order. So this App is truly a blessing. The contest was followed by a scrumptious dinner and an open bar ;) . The chocolate mousse was to die for. 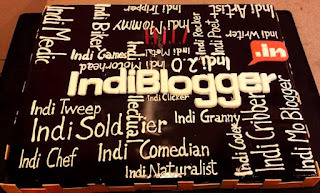 But the night was truly amazing , we also got our person Indiblogger Tshirts :D.
Me and a few friends also connected with Poonam Kaul ( Nokia - Director Communications). She shared her very cool visiting card with us ( Nokia employees have cool cards :O ). She was very sweet and asked us to be in touch. PPS: Nokia is coming up with the " Your Wish is Our App" Contest , So if you ever dreamed of a App which you would like to download , here is your chance to get it made for you. Oh yes, the questions were googlies...and as Rajiv said....we were thanking our stars indeed. But you guys did do a fab job overall. Well done. Looks like you went to a picnic and had loads of fun, sounds exciting. omg!!! i cant believe i missed this one.. damn! I wish they did that kind of thing where I am! Where Hibiscus Grow in Abundance. On running and all that . 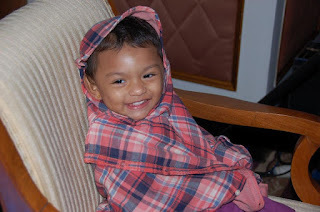 Love Marriage ya Arranged Marriage ?